It is always nice to have an edge, an advantage, something in your favor. Home court advantage or having a unique skill that helps to succeed over others is exactly what we want in a game – but also exactly what we want when we are facing the challenges in our health. This week marked an exciting leap forward in giving all of us an “edge” in cancer treatment. There’s now new technology designed to perform advanced, non-invasive cancer procedures anywhere in the body with extreme precision and low-toxicity. And, I should mention that Henry Ford Hospital is the only location in North American – and among only two worldwide – equipped to give patients a new “edge” in the fight against cancer. We are now home to the Edge™ Radiosurgery Suite, which uses new real-time tumor tracking technology and motion management capabilities, making it possible to protect healthy tissue with sub-millimeter accuracy, improving both safety and comfort for patients. The Edge offers results comparable to surgery, but without the incision or hospital stay, treating patients in 15 minutes or less, and returning them to their everyday lives. So when we say, “Game on Cancer,” we really mean it (and it’s not just because former Lions wide receiver Herman Moore attended the ribbon cutting for the Edge). Herman Moore joins Drs. Siddiqui, Kalkanis, Conway, Movsas, Chapman, and Bob Riney and myself to officially launch the Edge. Herman is a perfect example of having an edge. 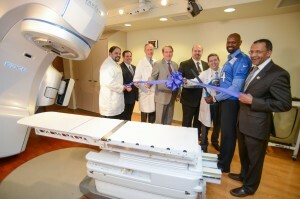 The Edge truly takes cancer radiation therapy to the next level.